Pardon me for judging a book by its cover, but a bar controlled by a robot it simply bad news bears. Why? Because the robots will always put the minimal amount of liquor in cocktails, which is generally too weak for my liking. 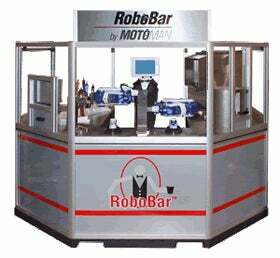 The RoboBar can automatically pour cocktails, beer, wine, juices and soft drinks. Apparently, for the bar owner, this machine would significantly improve bartending by providing faster, cheaper and more accurate drinks. I guess the one advantage this system has, for the consumer, is lack of tip requirement. Unless, of course, the robot happens to be an animatronic Real Doll, then a tip if probably still required, even if it does feel a little creepy.